Elman is a Senior Chocolate Maker at our Valencia Street factory and the profile developer of our Cahabón, Guatemala 70% 2017 Harvest chocolate bar. 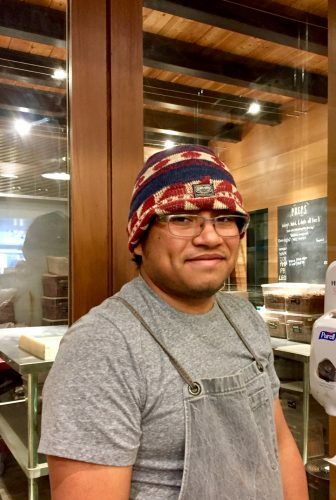 His story is a Dandelion Chocolate first: he was born in Guatemala City, and his father is from the north region, so this bar has such a strong family connection for him. Elman takes pride in all of his work, but he feels a particular responsibility in this 2019 release. We’ve asked him to share his experience with and connection to the cocoa beans from Cahabón. 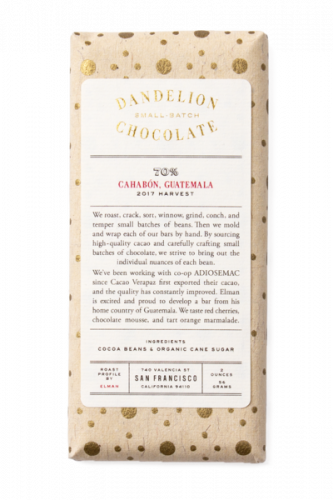 Back in the day when I joined Dandelion Chocolate, I was so happy that the company was working with beans from my country of Guatemala. It was an amazing surprise and I felt really proud that my country was represented in such a delicious way. I’ve always wanted to work with the Cahabón, Guatemala beans but I knew it was a long shot. I was sad when I heard the Cahabón bar was no longer being made by the Valencia team, but also happy because I got to work with beans that have some cultural relationship with Guatemala. I was given the opportunity to work with the Guatemalan beans for a limited time. This profile is going to be produced just one time and only tempered for two weeks before it is gone forever. I want to give this origin the farewell it surely deserves for what it represents to me. While working with these beans, I was surprised to find a different set of flavors from our previous 2014 Harvest Cahabón, Guatemala bar, which tasted like rich chocolate, walnuts, and liquid caramel. This new bar iteration of these fantastic beans is packed with lots of fruity notes while keeping its rich chocolatey notes. That was a nice surprise and something I knew I wanted to explore. I wanted to give the Cahabón bar more balanced tasting notes and get rid of the earthiness that the previous bar had. I still wanted to take the people trying the bar on a roller coaster of taste, but I wanted that experience to stay in the same line of flavors. That’s why this new bar starts with fruity notes that transform into rich chocolate and finishes with tart, fruity notes. Is this bar a personal achievement? The answer is YES! I love my country and I’m proud of what farmers are able to produce and the dedication that they put into their crops. This time it’s not just about my country, but also the reiteration of my love and passion of what I do for a living. I love working with chocolate and having opportunities like this profile. It helps me to showcase how much I have learned over the years. I’m beyond blessed to have had the chance to learn from people with so much talent and knowledge. My hope is to be able to pay it back and share that knowledge and passion with my team members. Elman es un fabricante de chocolates en nuestra fábrica de Valencia Street y el desarrollador del perfil de nuestra barra de chocolate de 70% de Cahabón, Guatemala de la cosecha 2017. 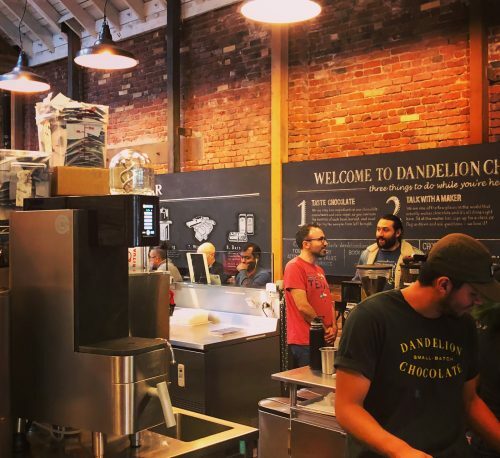 Su historia es única en la historia de Dandelion Chocolate: Elman nació en la ciudad de Guatemala, y parte de la la familia de su padre viene de la región norte del país, por lo que esta barra tiene una conexión familiar muy fuerte para él. Elman se enorgullece de todo su trabajo, pero siente una responsabilidad particular en esta versión del 2018. Le hemos pedido que comparta su experiencia y conexión con los granos de cacao de Cahabón. El día en que me uní a Dandelion Chocolate, estaba muy feliz de que la compañía trabajara con semillas de cacao de mi país: Guatemala. Fue una sorpresa increíble y me sentí realmente orgulloso de que mi país estuviera representado de una manera tan deliciosa. Siempre quise trabajar con las semillas de Cahabón, Guatemala, pero sabía que era una posibilidad algo remota. Me sentí triste cuando escuché que la producción de la barra de chocolate de Cahabón iba a concluir, pero también feliz porque pude trabajar con semillas que tienen alguna relación cultural con Guatemala. Recientemente, me dieron la oportunidad de trabajar con la semilla de cacao Guatemalteca por un tiempo limitado. Este perfil se producirá solo una vez y solo se templará durante dos semanas antes de que desaparezca para siempre. Es mi deseo darle a este origen la despedida que seguramente merece por lo que representa para mí. Mientras trabajaba con esta semilla, me sorprendió encontrar un conjunto diferente de sabores a la de nuestra barra de la cosecha 2014, la cual tenía un sabor profundo a chocolate, nueces y caramelo líquido. Esta nueva versión de esta fantástica semilla está repleta de notas frutales y mantiene sus notas profundas a chocolate. Esa fue una agradable sorpresa y algo que sabía que quería explorar. Quería darle a la barra de Cahabón notas de sabor más equilibradas y deshacerme de la terrenalidad que tenía la barra anterior. Quería llevar a la gente que probará esta barra de chocolate en una montaña rusa de sabor, pero quiero que esa experiencia se mantenga en una misma línea de sabores. Es por eso que esta nueva barra comienza con notas frutales que se transforman en un chocolate profundo y terminan con notas agrias y afrutadas. ¿Es esta barra un logro personal? ¡La respuesta es sí! Amo a mi país y estoy orgulloso de lo que los agricultores pueden producir y de la dedicación que ponen en sus cultivos. Esta vez no se trata solo de mi país, sino también de la reiteración de mi amor y pasión por lo que hago para ganarme la vida. Me encanta trabajar con chocolate y de tener oportunidades como desarrollar este perfil. Lo cual me ayuda a mostrar cuánto he aprendido a través de los años. Estoy más que feliz de haber tenido la oportunidad de aprender de personas con tanto talento y conocimiento a través de los años. Mi esperanza es poder devolver la oportunidad y poder compartir ese conocimiento y pasión con los miembros de mi equipo actual. Loving people can be sweet. But the love of a good cookie can be transformative! 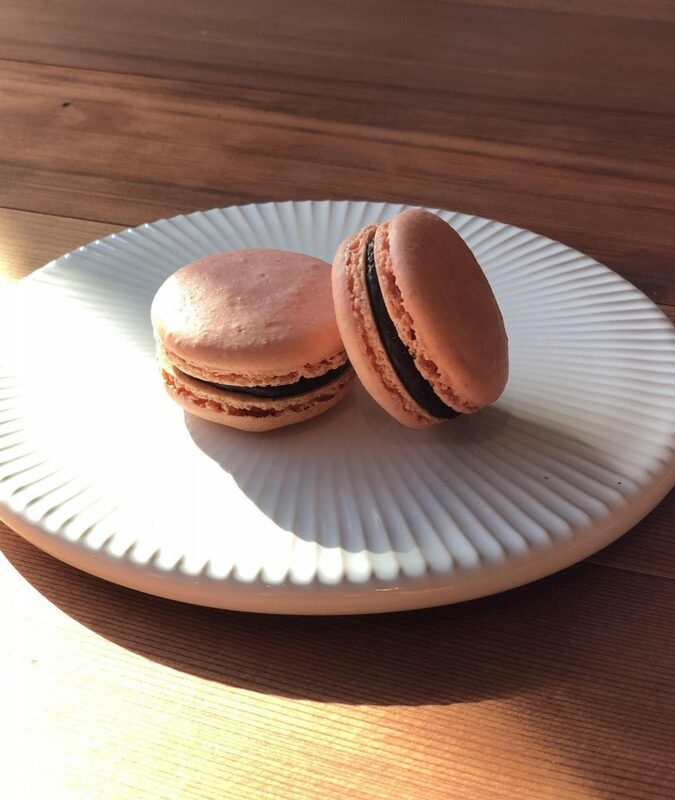 For the third year in a row, we are delighted to be tucking our kitchen’s handmade pink macarons into pretty bowed boxes special for Valentine’s Day. Crisp and chewy almond meringue cookies sandwich a Camino Verde, Ecuador single-origin chocolate ganache — this year with the flavors of the kitchen team’s favorite cocktails. If you’re local to San Francisco, we can’t wait for you to see these – and, of course, to taste them! Mary and the whole kitchen team have been flooded with preparations. You can only imagine what 2,000 macaron tops and bottoms in petal pink look like when spread across our tiny kitchen. We’re only able to produce 100 boxes. And because they’re too delicate to ship, you can only find them at our SF Valencia Street and Ferry Building shops. Why the fear? “The thing about macarons is that something can go wrong at nearly every single step of the process, and they are delicate: the almond flour must be ground and sifted finely enough, the egg whites must be at room temperature, the meringue must be folded into the almond-sugar mixture enough (but not too much!). This process is known as macaronage, and when done correctly, it produces a thick batter that flows like lava but still holds its shape when piped.” Like many great elements of French cooking, the ingredient list for the cookies is simple: ground almonds, egg whites, and sugar. And quite literally, the temperature or humidity of the air can make or break these cookies. It is no small feat to get that perfect crisp-on-the-outside, tender-on-the-inside texture every time. The single-origin chocolate ganache filling, made with our Camino Verde, Ecuador ground chocolate and rich cream to make it silky, takes a new twist every year. For 2019, it’s cocktail time! (The rich, chocolatey center will have the flavor of the spirits, but almost none of the booze.) Each box contains 10 macarons total with two of each flavor: Fernet, Mai Tai, Manhattan, Negroni, and Paloma. The beautiful, reusable gift box is decorated with one of the pretty patterns we design ourselves, and finished with a satin bow we tie by hand. Find the macaron gift box in both of our SF shops February 13th and 14th, 2019, for $35. We’ll also have bouquets of flowers on hand on Valencia Street to help you woo your Valentine. Ready to try something extravagant with your cacao nib brewed coffee? Come and see us at the SF Valencia street cafe for Chef Lisa Vega‘s baked goods featuring summer’s best fruit paired with chocolate. 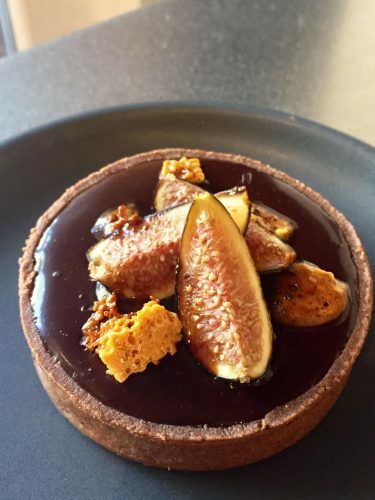 Say hello to the fig tart with balsamic caramel, honey ganache, and crisp honeycomb. 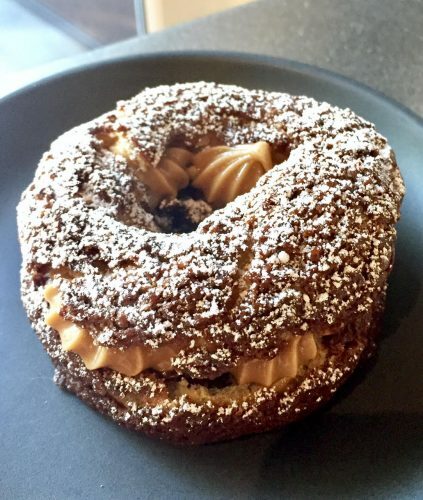 Round like a bicycle wheel and named for a well-known French bike race route, meet the Paris-Brest pastry with hazelnut praline cream and chocolate ganache. 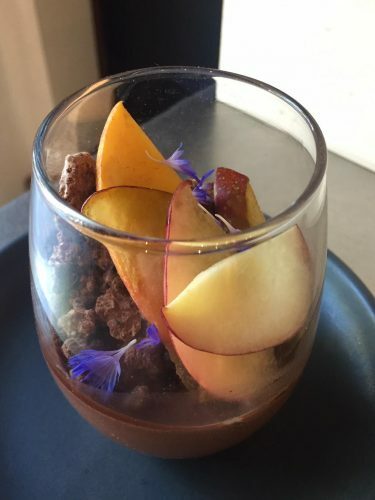 Ready for spooning, the chocolate pannacotta with rich tahini, nutty sesame soil, and tangy stone fruit is a contrast in tangy and sweet. 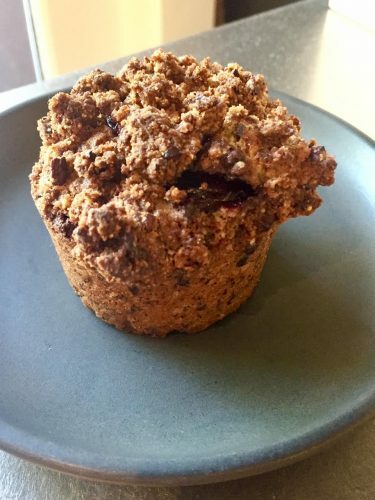 Don’t let the muffin shape fool you. This is our old-fashioned coffee cake with Camino Verde chocolate, bright cherries, and cocoa nib nut streusel. Jennifer has handled the public relations for Dandelion since 2013, and she’s an avid drinker of coffee in the cafe. For this piece, she spoke with Voga Coffee’s co-founder and CEO Eli Salomon who, along with Josh Avins, CTO and scientist behind the technology, and Jason Sarley, co-founder and Chief Coffee Officer, are the creators of the Ground Control vacuum coffee machine. The Ground Control Cyclops coffee brewer behind the counter at the Valencia Street cafe. 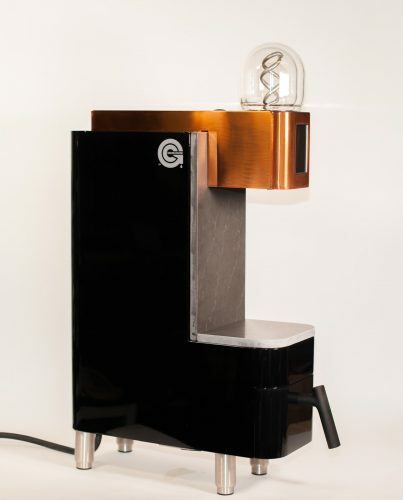 If you’ve been in our café on Valencia Street recently, you’ve probably seen a very futuristic-looking machine topped with hand-blown glass bulbs. It’s a new coffee machine called Ground Control® Cyclops from the innovative folks at Oakland-based Voga Coffee. We’re the first café in the world to have this machine, and it just won the Specialty Coffee Association 2018 Best New Product award. We’re thrilled to be serving both brewed coffee and brewed cacao nib coffee with Ritual’s beans. Keep your eye on the Cyclops when you next visit our Valencia café. Since launching the brewed coffee and the cacao nib brewed coffee at the end of May, 2018, the feedback has been very positive. People love it! Cacao nib coffee makes you less jittery than regular coffee, and it has a more uplifting buzz. Along with the normal caffeine kick, it must be the theobromine from the nibs that helps give your mood a boost. 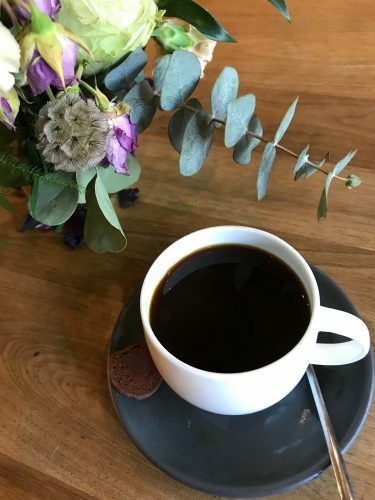 Currently, we’re offering a Ritual single-origin brewed coffee from Guatemala as well as the cacao nib coffee with our Camino Verde, Ecuador nibs. We look forward to having you come by to try it. Let us know what you think! Don’t worry; you still get one of our signature shortbread cookies with every cup.